© 2002, © 2019 by Paul Freeman. Revised 1/6/19. Moorefield Airport, as depicted on the May 1944 Huntington Sectional Chart. as it was not yet depicted on the November 1942 Huntington Sectional Chart. The earliest depiction which has been located of Moorefield Airport was on the May 1944 Huntington Sectional Chart. 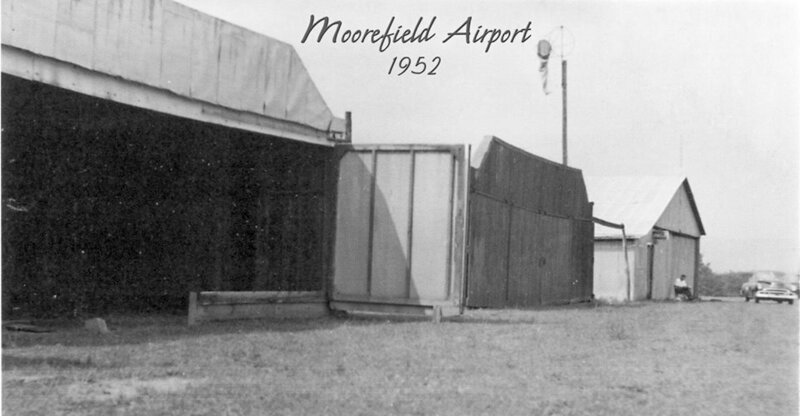 It depicted Moorefield as a commercial/municipal airport. The earliest photo which has been located of Moorefield Airport was a 1952 photo (courtesy of Rick Harshbarger) of a row of hangars. 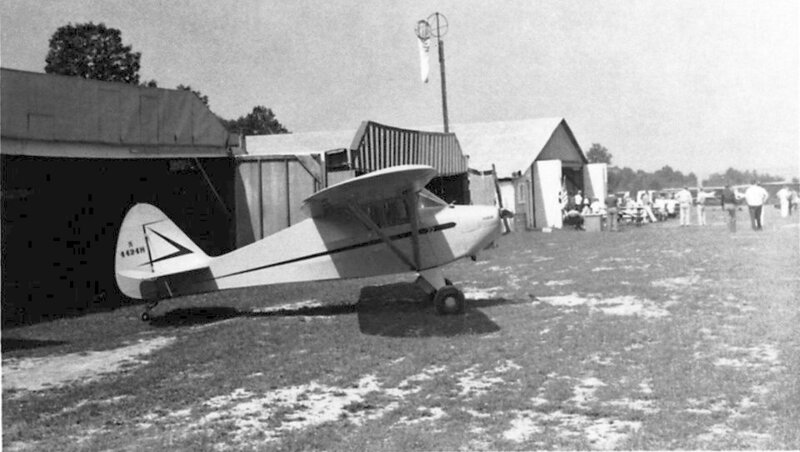 The only photo which has been located showing an aircraft at Moorefield Airport was a June 1960 photo (courtesy of Rick Harshbarger) of a Piper Vagabond PA-15 N4424H in front of the row of hangars. A 3/16/66 USGS aerial view depicted Moorefield Airport as having a grass northwest/southeast runway, with 4 small buildings/hangars on the southeast side. 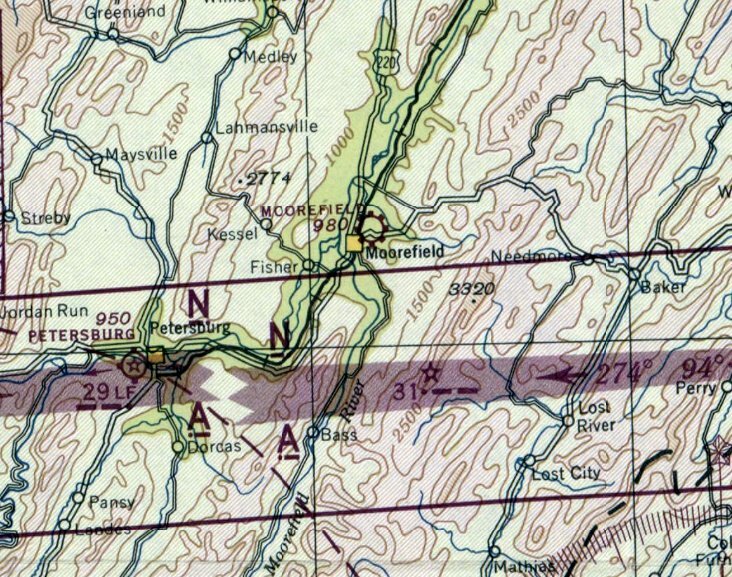 Strangely, Moorefield Airport was not depicted at all on the 1966 USGS topo map. The last aeronautical chart depiction which has been located of Moorefield Airport was on the February 1969 Huntington Sectional Chart. 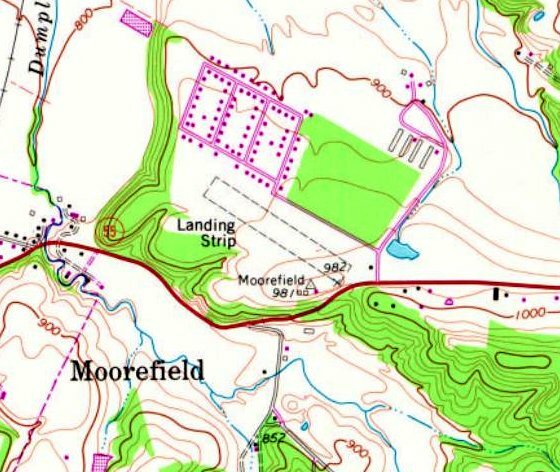 It depicted Moorefield Airport as having a 2,800' unpaved runway. 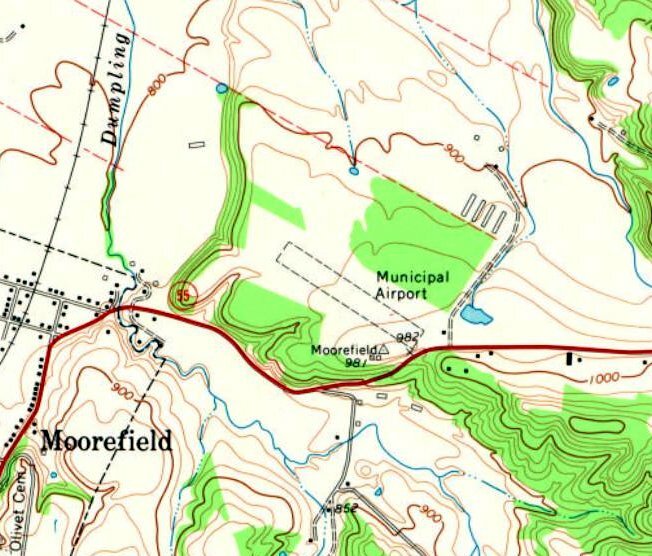 The earliest topo map depiction which has been located of Moorefield Airport was on the 1970 USGS topo map. It depicted Moorefield “Municipal Airport” as having a single unpaved northwest/southeast runway, with 1 small building on the southeast side. as it was no longer depicted on the March 1978 Washington Sectional Chart. The last reference that can be found to Moorefield Airport was in the 1979 WV Airport Directory (courtesy of Rick Harshbarger). and to have 2 turf runways (2,800' runway 14/32 & 2500' Runway 10/28), which is odd since previous depictions only showed a single runway. It was also said to have a hangar & tiedowns. 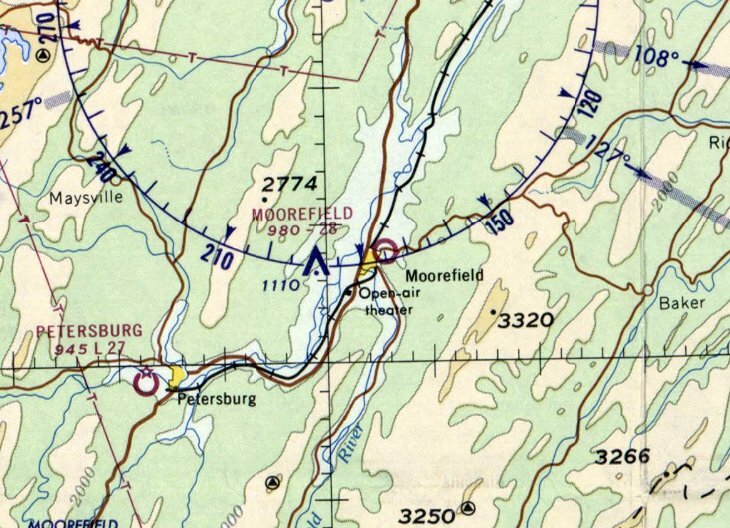 ccording to Rick Harshbarger, Moorefield Airport was no longer listed in the 1980 WV Airport Directory or further editions. but it was labeled generically as “Landing Strip”. 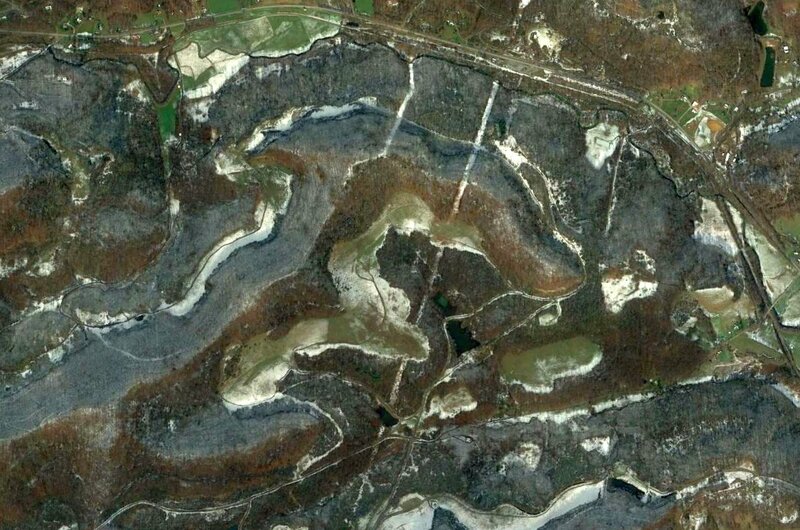 A 1991 USGS aerial view looking north depicted the former grass runway at Moorefield Airport as still remaining clear, but appearing to have been returned to cultivation. Three of the 4 former hangars remained on the southeast side. erasing the remnants of this little airport. 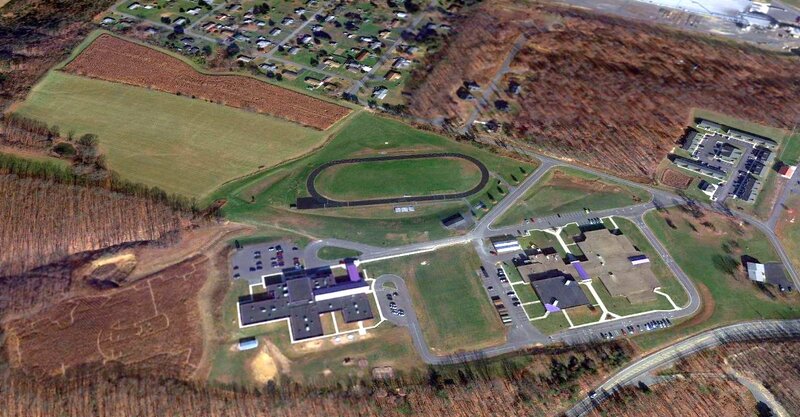 A 2013 aerial view looking north showed Moorefield Intermediate School & Moorefield Middle School occupying the southern portion of the Moorefield Airport site. The only trace remaining of the little airport is the shape of the clearing of the northwest end of the runway. 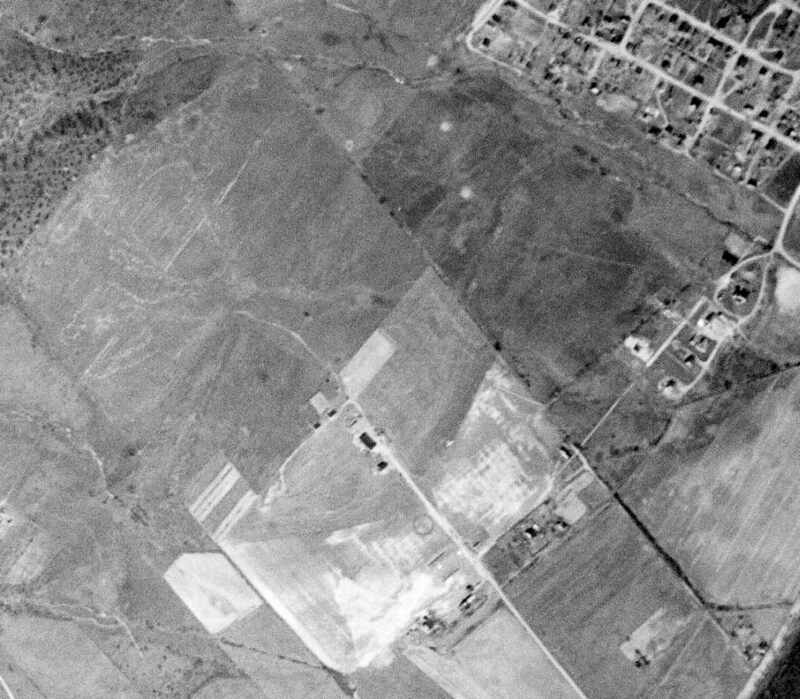 A 4/12/56 USGS aerial photo depicted Thomas Airfield as having a single unpaved northwest/southeast runway. Not much is known about this small rural airfield, including its date of construction, purpose, or name. 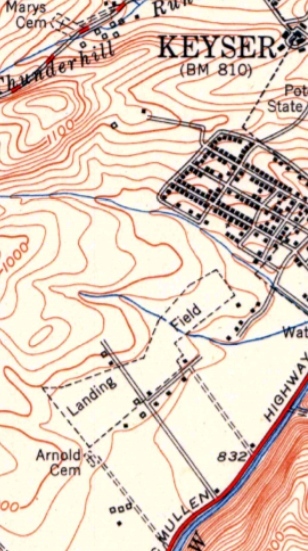 The 1959 USGS topo map depicted the northwest/southeast clearing of the Thomas Airfield runway, but did not label the airfield. The Thomas Airfield was not depicted at all on the 1960 Huntington Sectional Chart. The 1995 USGS topo map depicted Thomas Airfield as a single northwest/southeast runway, labeled simply as “Landing Strip”. The Thomas Airfield was not depicted at all on the July 2001 Cincinnati Sectional Chart (courtesy of Rick Harshbarger). A circa 2010 aerial view looking south depicted a single T-hangar on the south side of the Thomas Airfield runway. 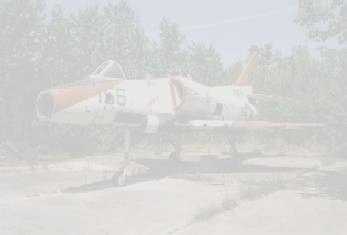 The T-hangar appeared to be open on the north side, but it was not evident if there was an aircraft inside. As of 2015, there was no airfield in Thomas registered with the FAA. 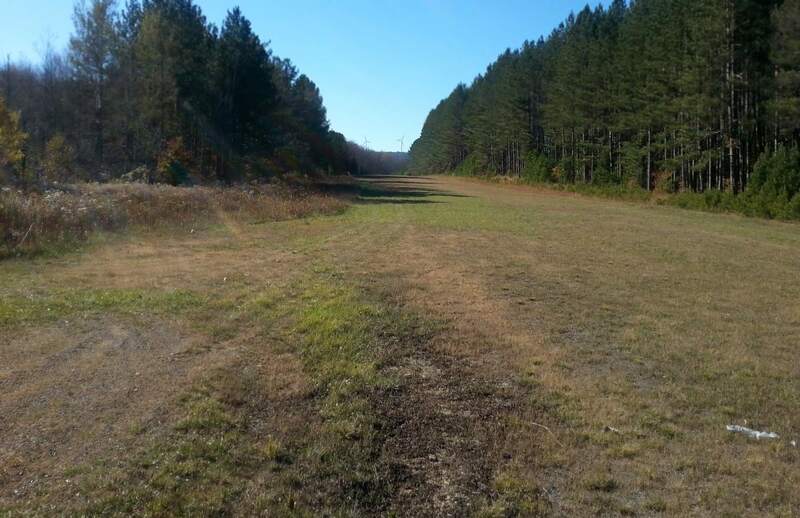 A 2015 photo by Rick Harshbarger looking northwest from the midpoint of the Thomas Airfield runway. Rick reported, “It wasn't as easy to find as I thought, but with the help of a worker at the Thomas town hall, I eventually found it. It's in MUCH better shape than I thought it would be. There are no aircraft there, but the runway is in very good shape. I guesstimate the strip to be 2,750' x 80'. It appears to be rolled & mowed. They've extended it to the southeast [compared to the 2013 aerial] picture - definitely longer in that direction now. Rick also observed a “Runway drag for smoothing [the] runway”, and an “Old DOH road grader obviously used to work [the] runway. Note the 2 windmills directly along the runway extended centerline, though. A 2015 photo by Rick Harshbarger looking northwest at the former T-hangar at Thomas Airfield. Thomas Airfield is located at the northern terminus of Airport Road, appropriately enough. 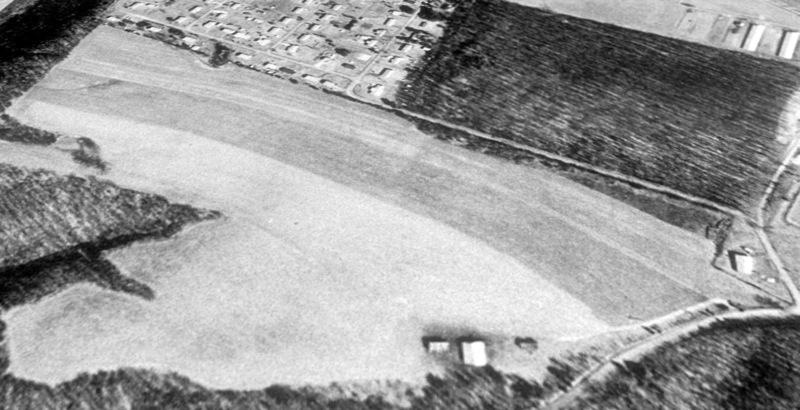 A 3/31/47 USGS aerial photo depicted one light-colored small aircraft in the middle of Keyser Airport. 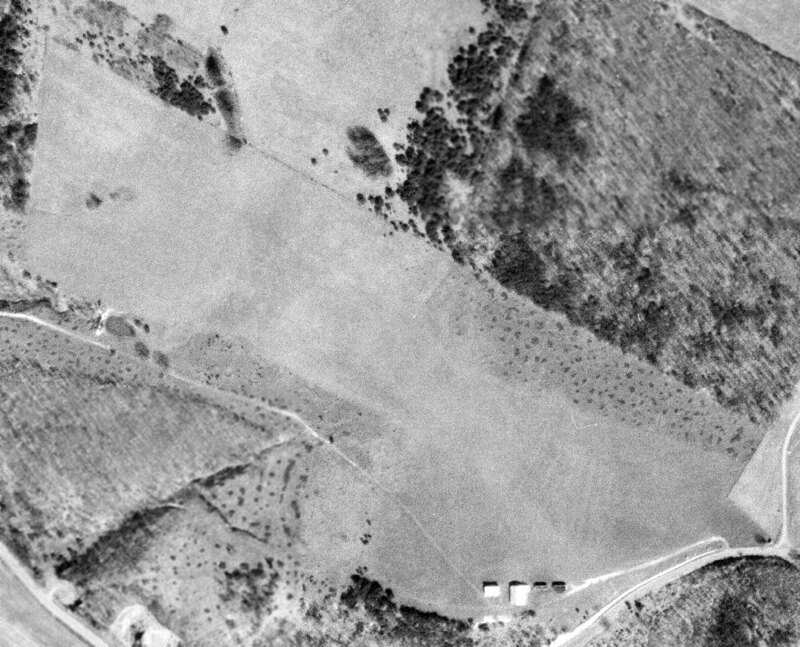 The earliest depiction which has been located of Keyser Airport was on a 3/31/47 USGS aerial photo. several small buildings (hangars? ), and one light-colored small aircraft in the center of the photo. Broadus Bowman recalled, “It was called the Keyser Airport. One could take lessons there - they had a couple of J-3 Cubs. A number of airplanes were tied down there, and I believe there were a few hangars. It was located a couple miles south of Keyser on the west side of U.S. Route 220 - about a half-mile or mile off the road. which depicted Keyser as having a mere 1,800' unpaved runway. with a few small buildings on the periphery. According to Saundra Pancake, “The airport closed 6/1/56 & the operator of airport at that time was Stanley Dantzic. Bill Pancake was the last person to fly off of the airport on October 1958. 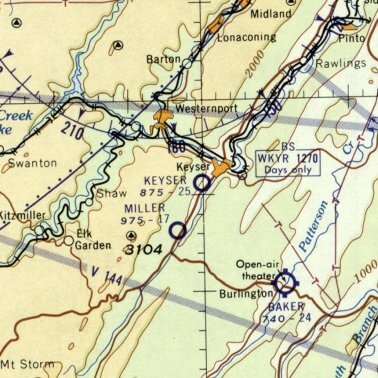 The last depiction which has been located of Keyser Airport was on the January 1960 Huntington Sectional Chart. It depicted Keyser as having a 2,500' unpaved runway. 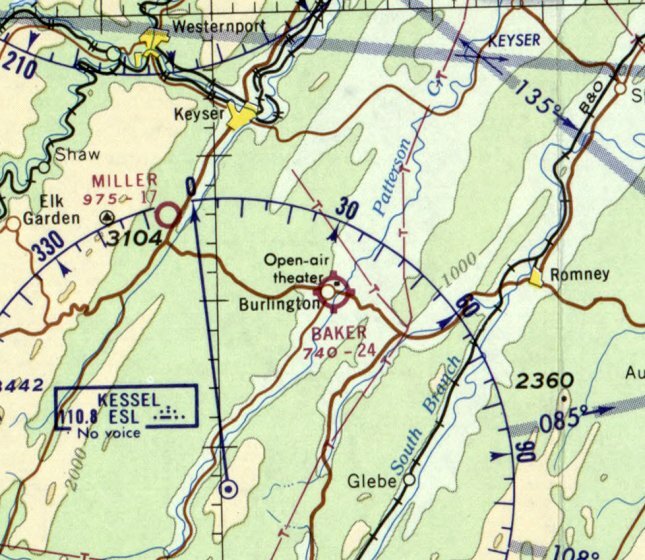 Keyser Airport was no longer depicted on the July 1962 Huntington Sectional Chart (courtesy of David Stevenson). 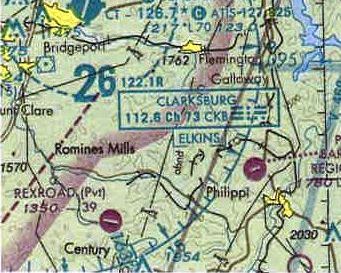 The 1972 USGS topo map continued to depict Keyser Airport as an irregularly-shaped outline, labeled simply as “Landing Field”. 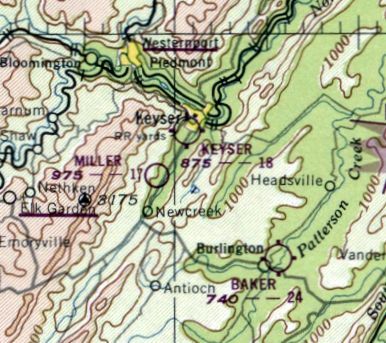 The 1976 USGS topo map depicted streets & houses covering the site of Keyser Airport. 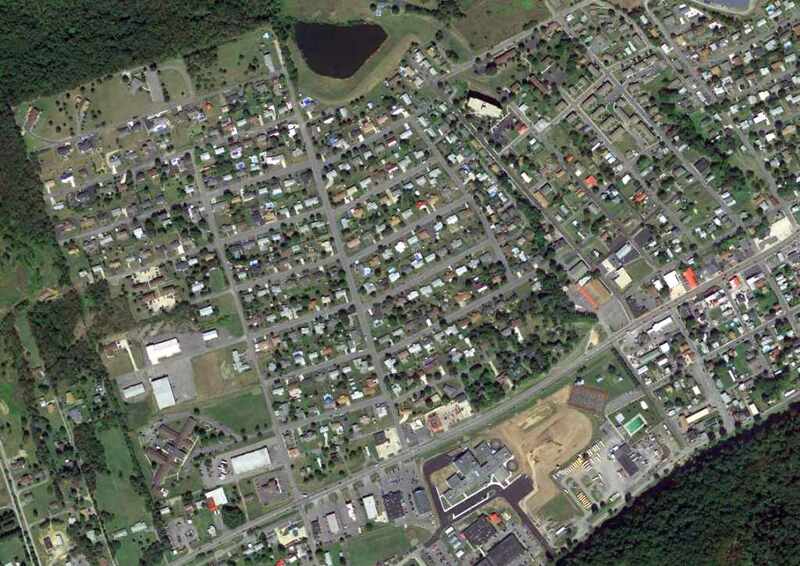 A 9/5/13 aerial photo showed houses covering the site of Keyser Airport. However, according to Rick Harshbarger, the light-colored building at the bottom-left is the former main hangar. 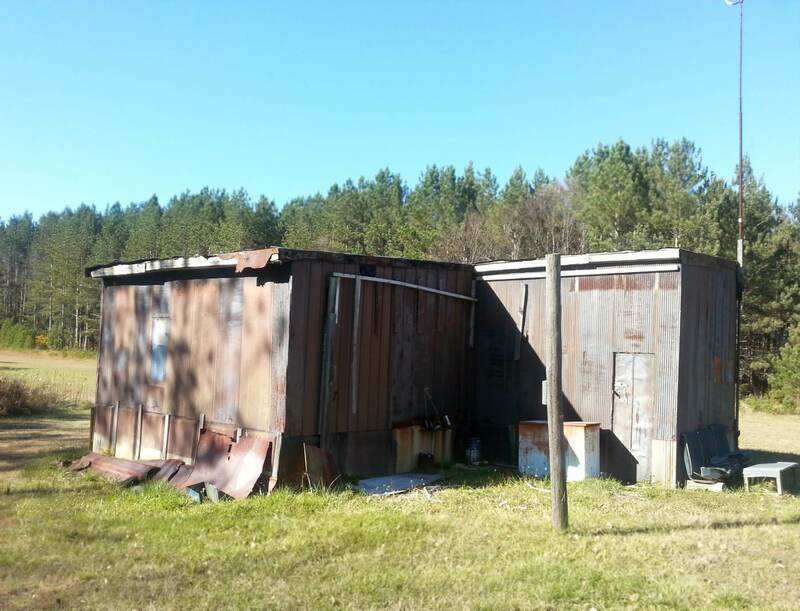 According to Saundra Pancake, “The end of the runway was where Piney Valley is now. The names of the streets in Airport Addition are aviation tems & names of the Ludwick family members. Chandelle is the name of an aircraft maneuver. Beacon for the beacon navigation light. Terri was Aronold Ludwick granddaughter. The site of Keyser Airport is located at the intersection of Beacon Street & Airport Street, appropriately enough. The 1981 USGS topo map depicted the 1st location of the Rexroad Airfield simply as “Airstrip”, but curiously did not depict a runway. 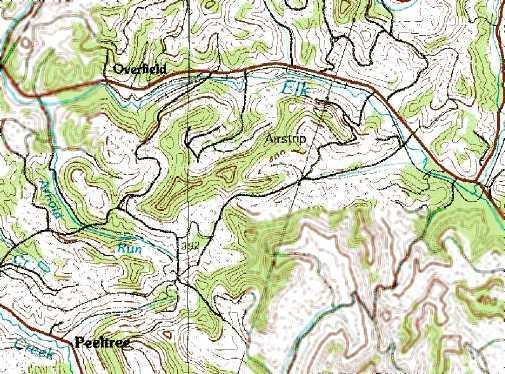 as it was not yet depicted on the 1977 USGS topo map. 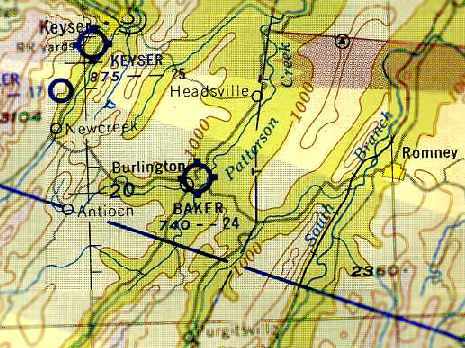 The earliest depiction of the Rexroad Airfield which has been located was on the 1981 USGS topo map. Curiously, it labeled the site as “Airstrip”, but did not actually depict a runway. 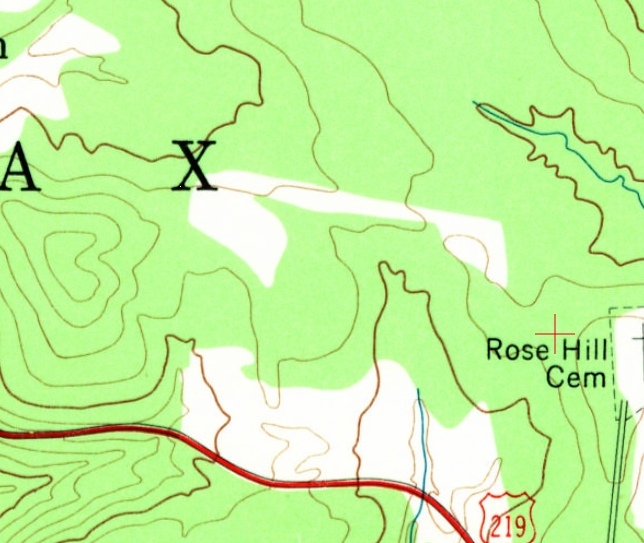 The last depiction which has been located of the original Rexroad Airfield was on the 1988 USGS topo map. 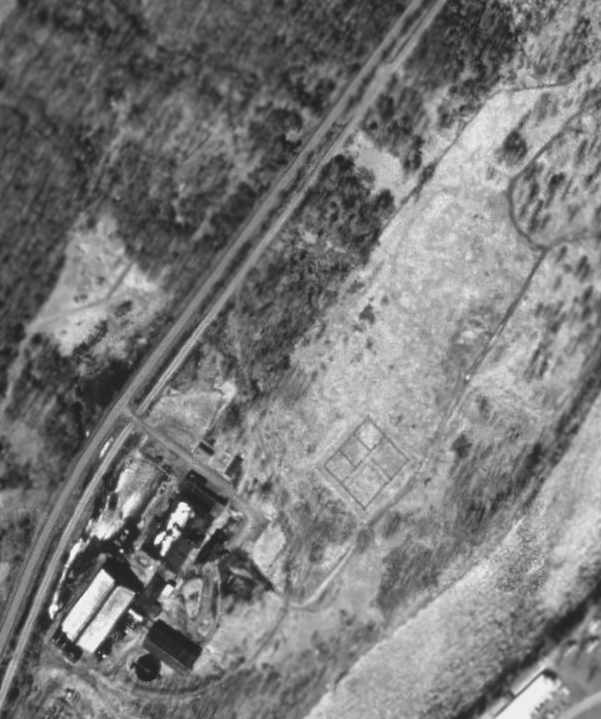 as the 1997 USGS aerial photo did not depict any trace of an airfield at the original location. It appeared as if the original location had been replaced by strip mines. 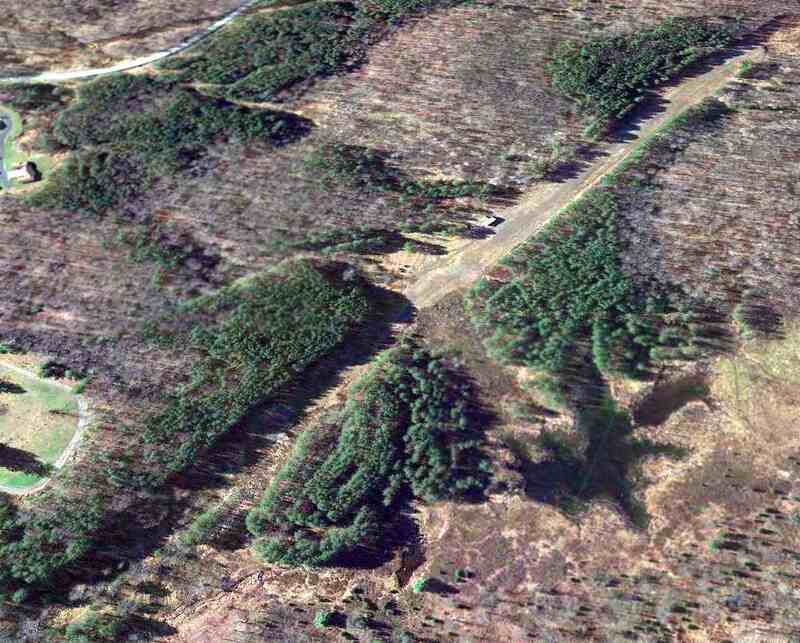 A 2013 aerial view did not show any recognizable trace remaining of the original Rexroad Airfield. The site of the original Rexroad Airfield is located west of the intersection of Route 57 & Isaac S Run. was evidently replaced by a new location. 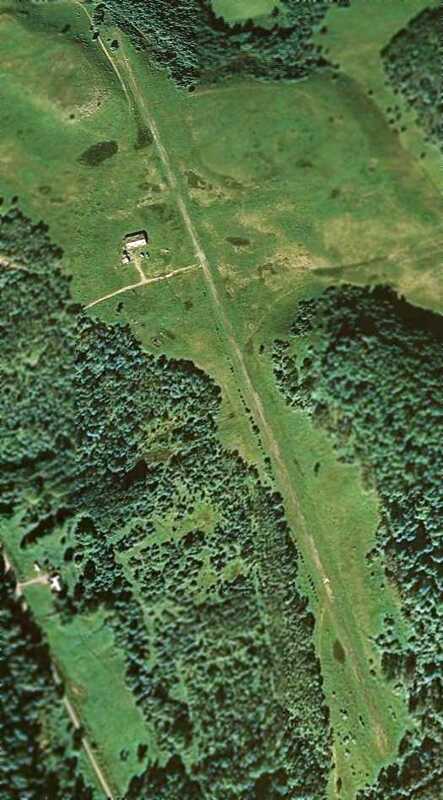 The earliest depiction which has been located of the 2nd site of this airfield was the 1997 aerial photo. It depicted Rexroad as having a single east/west paved runway, with a hangar on the south side. The earliest aeronautical chart depiction which has been located of the Rexroad Airfield was on the July 2001 Cincinnati Sectional Chart (courtesy of Rick Harshbarger). It depicted Rexroad as a private airfield having a single east/west 3,900' paved runway. 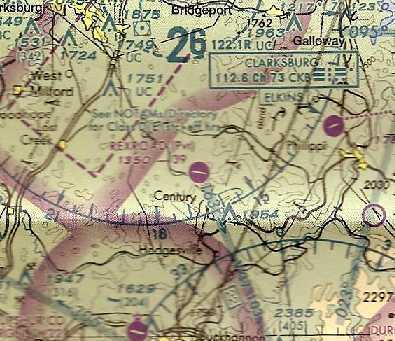 The last aeronautical chart depiction which has been located of the Rexroad Airfield was on the July 2004 Cincinnati Sectional Chart. as an August 2007 aerial view looking northwest at the Rexroad Airfield showed the runway marked with a closed “X” symbol at each end. The hangar appeared to have a checkerboard roof. The Rexroad Airfield was depicted as an abandoned airfield on the July 2008 Cincinnati Sectional Chart. The site of the 2nd location of Rexroad Airfield is located north of the intersection of Route 20 & Arnolds Run. The Burlington Airport, as depicted on the November 1942 Huntington Sectional. The date of establishment of the Burlington Airport has not been determined. According to Bo Bowman, “The Burlington Airport probably opened in the late 1930s. who recalled, “From 1938-42 we were at Keyser & I remember seeing my very first airplane at the Burlington Airport. It was a bright yellow Piper Cub. 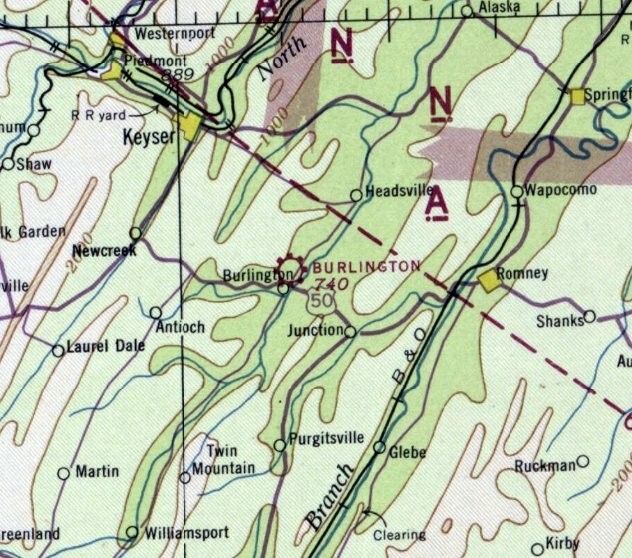 Burlington Airport was not yet depicted on the June 1942 Huntington Sectional Chart. was on the November 1942 Huntington Sectional Chart. described Burlington Airport as having a 2,000' unpaved runway. depicted Burlington Airport as having a single northeast/southwest grass runway. A single light plane was visible at the southwest corner. as a 30 acre irregularly-shaped property within which were 2 sod runways, measuring 1,850' ENE/WSW & 1,000' NNE/SSW. According to Bo Bowman, “A 1945 Airport Directory described it as having a sod east/west 2,200’ x 500’ runway. was obtained & shipped to this airport by a local Army Air Corps man. with 2 or 3 light planes parked near a few small buildings on the southwest side. that is how it was labeled on the 1948 Huntington Sectional Chart. It depicted Baker as having a 2,400' unpaved runway. 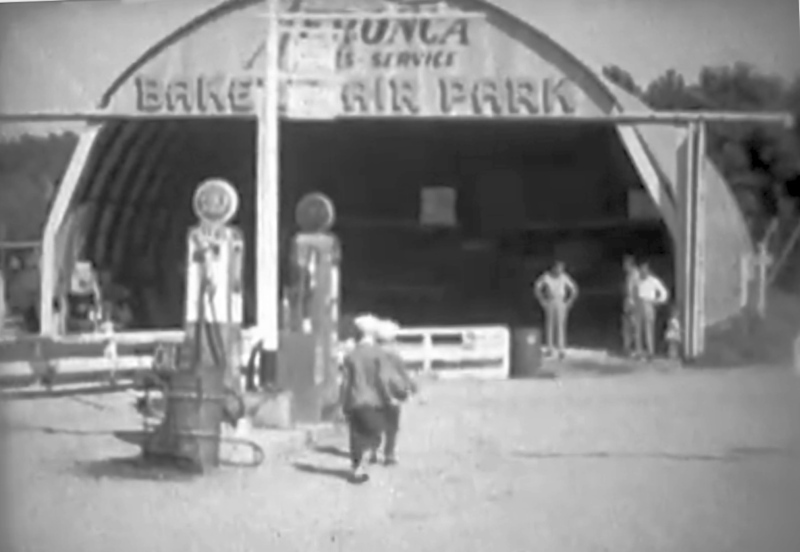 A still image of the “Baker Air Park” hangar from a 16mm film taken on 9/11/49 (courtesy of Bo Boman). The boy with the sailor hat in the foreground is Bo Bowman, with his younger cousin Paul leading him to the hangar. 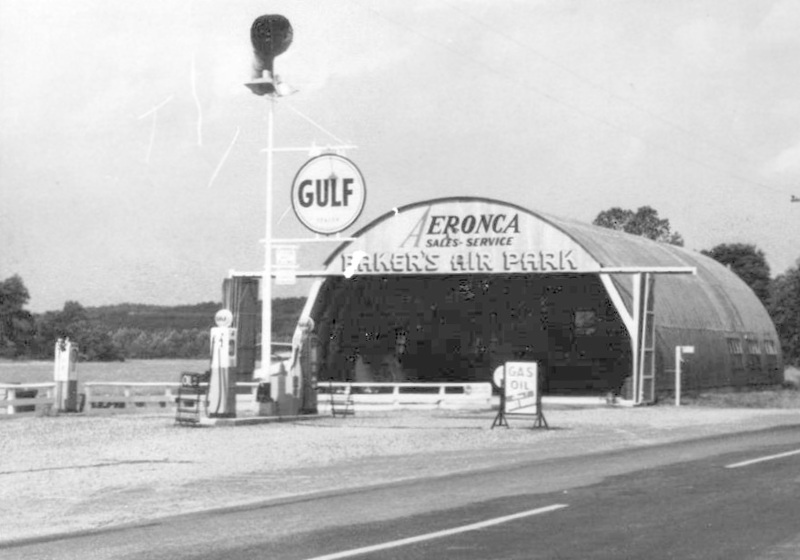 A circa 1940s picture of the same Baker's Air Park hangar (courtesy of Rick Harshbarger). 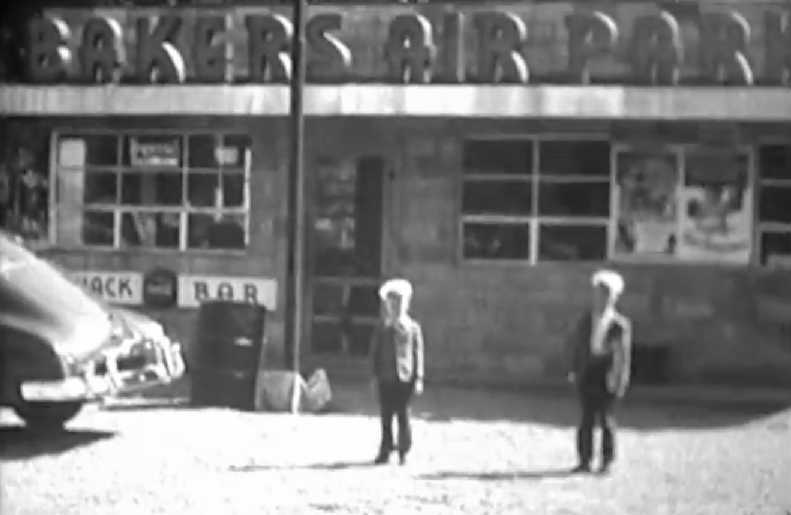 A still image of Bo Bowman & his cousin Paul in front of the “Bakers Air Park” snackbar from a 16mm film taken on 9/11/49 (courtesy of Rick Harshbarger). offering passenger rides primarily on weekends. The aircraft used for this purpose in the late 1940s were 2 Aeronca Champs. The airport was owned & operated by David Baker. This is where flying began for me at the age of about 8. I have lots of memories from there. depicted Baker as having a 2,400' unpaved runway. 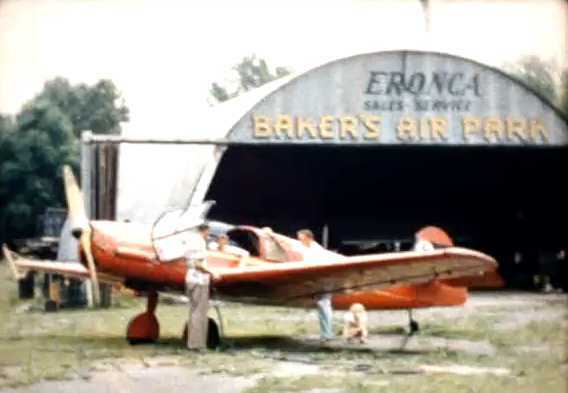 A still image from a Summer 1956 movie of the pretty red Messerschmidt Me108 in front of the “Baker's Air Park” hangar (courtesy of Rick Harshbarger). According to Rick Harshbarger, “My Dad knew the guy with the Messerschmidt. They were both WW2 veterans. 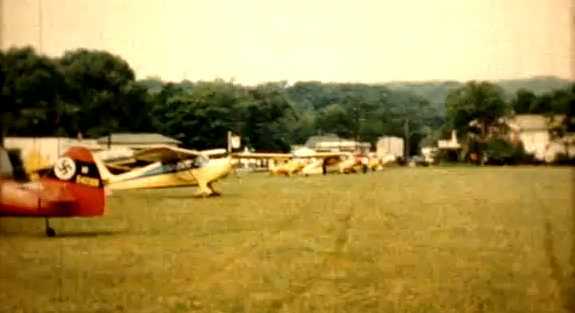 A still image from a Summer 1956 movie of the Messerschmidt Me108 & 5 other single-engine planes at Baker's Air Park (courtesy of Rick Harshbarger). 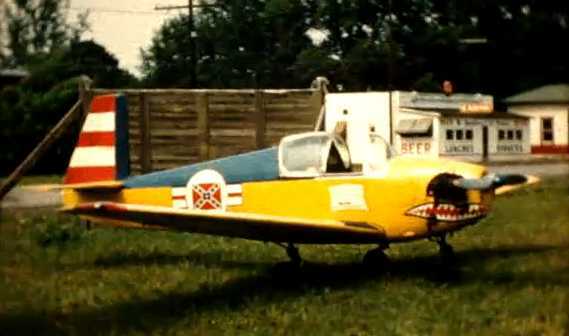 A still image from a Summer 1956 movie of a fancifully painted Mooney Mite of the Confederate Air Force at Baker's Air Park (courtesy of Rick Harshbarger). 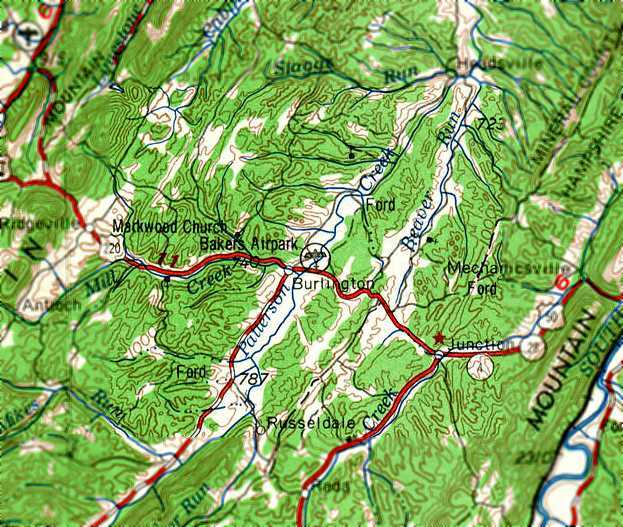 The 1956 USGS topo map depicted it as “Bakers Airpark”. A circa late 1950s – early 1960s aerial view looking south at Baker Air Park (courtesy of Rick Harshbarger). 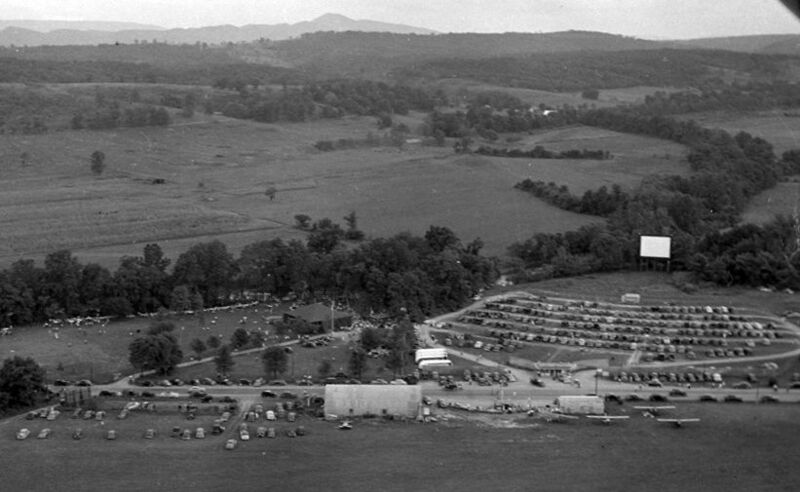 Rick remarked, “It's on the day of the annual 'Mill Picnic' held by the big paper mill in nearby Luke MD, Westvaco Corp.
You can see a huge crowd gathered for food, fun, games, plane rides, and that night, a free movie at the Baker Drive-in across US Route 50 from the airfield. The last aeronautical chart depiction which has been located of Baker Airpark was on the February 1969 Huntington Sectional Chart. 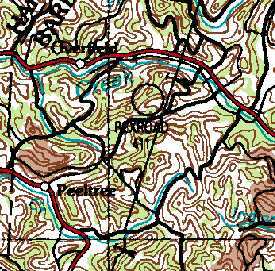 Bakers Airpark was no longer depicted at all on the 1969 USGS topo map. but another (unrelated?) airfield was depicted just to the southeast on the opposite side of Route 50. A June 2006 aerial photo by Bo Bowman looking north at the site of the former Baker Air Park. The former airport property appears to have been reused as a highway department facility. No trace appears to remain of the former airport. 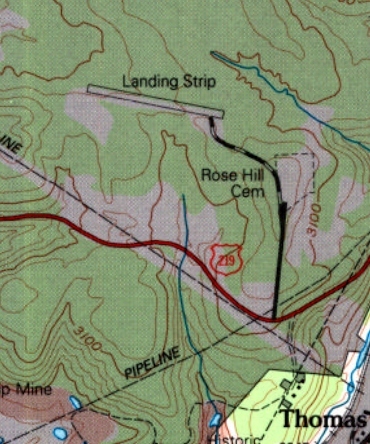 The site of the former Baker Air Park is located on the north side of Route 50, east of its intersection with Route 11.
on the northwest bank of the Cheat River on the 1960 USGS topo map. authorized the purchase of 196 acres of land on Dunkard Bottom along the Cheat River in Preston County. The camp was named in honor of William M. O. Dawson, a native of Preston County, who served as Governor from 1905-08. Troops began training at Camp Dawson during the summer of 1909 and continued until the start of Word War I. 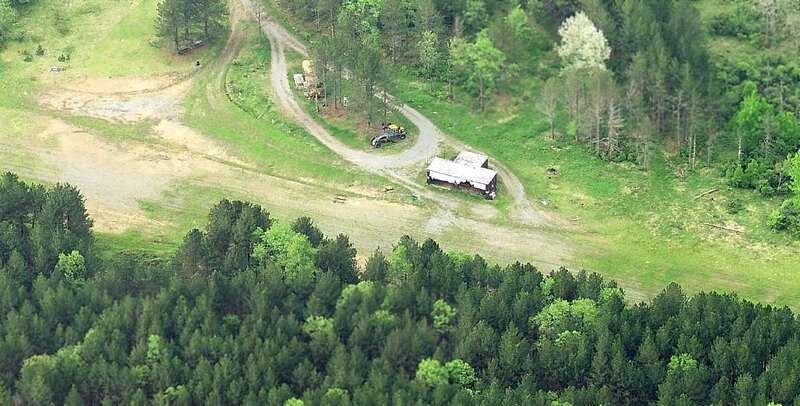 The camp was not used again until 1928 when it was reestablished as a training site for the West Virginia State Militia. at which time the United States Government leased the camp for use as a Prisoner of War camp. 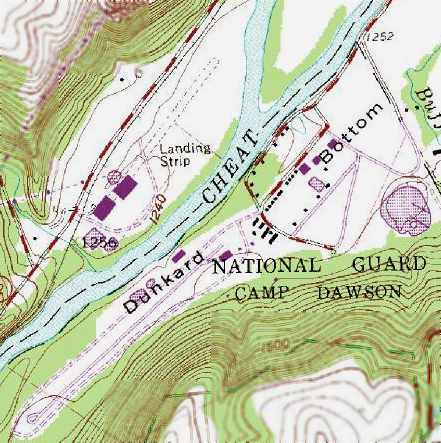 No airfield at Camp Dawson was yet depicted on the 1942 USGS topo map. 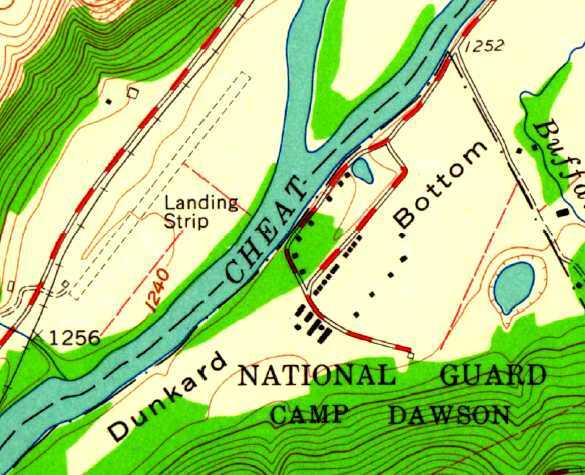 The original airfield for Camp Dawson was located on the northwest bank of the Cheat River. who recalled, “In 1954-58 I was attached to the 249th Army Band WVNG in Fairmont. and several times during those years we went up to Camp Dawson for rifle qualifications. I do remember there being a small field there. which depicted a single 2,500' unpaved runway, labeled simply as “Landing Strip”, with one small building on the southwest side. or the February 1970 Cincinnati Sectional Chart (according to Chris Kennedy). however the map also depicted 2 buildings superimposed over the southwest end of the runway. on the August 1976 Cincinnati Cincinnati Sectional Chart (courtesy of Chris Kennedy). 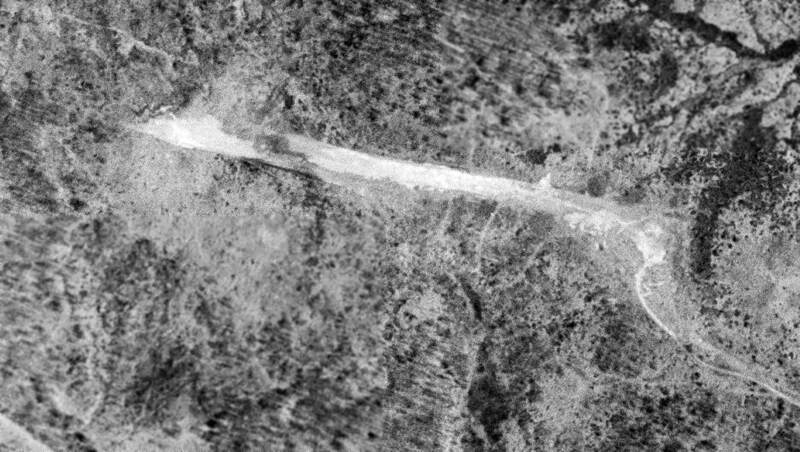 As seen in the 1997 USGS aerial photo, only the slightest trace is still recognizable of the outline of the runway of the original Dawson AAF. The original Dawson AAF is located in between Route 72 & the Cheat River.